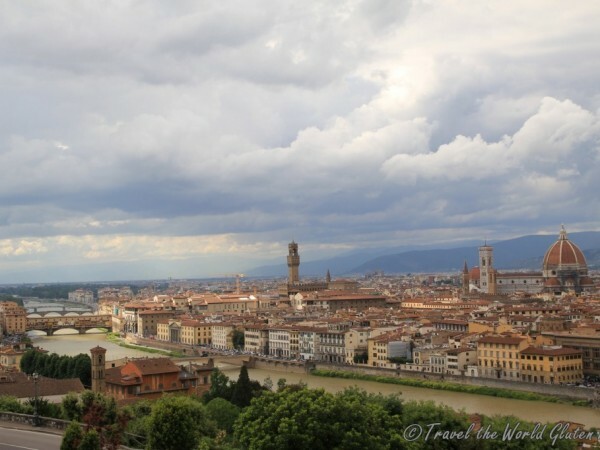 I’ve been lucky enough to have traveled to Italy three times, each as a gluten free traveler. In fact, I found out I had to be gluten free a mere three days before embarking on a month long trip to Italy in May 2010. 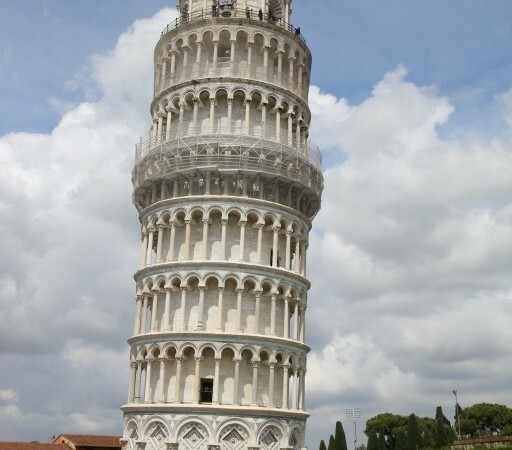 At the time I was upset thinking that I wouldn’t be able to enjoy the pizza and pasta Italy is known for; I mean what is a trip to Italy if you can’t enjoy the amazing food that so much of its culture is based around? Thankfully I soon learned two things. That quickly upon removing gluten from my diet I started to feel so much better. I could finally get out of bed instead of being curled up in the fetal position in so much pain, my energy level increased, my right arm no longer went numb, and the mysterious pain in my right calf disappeared. I felt good again. 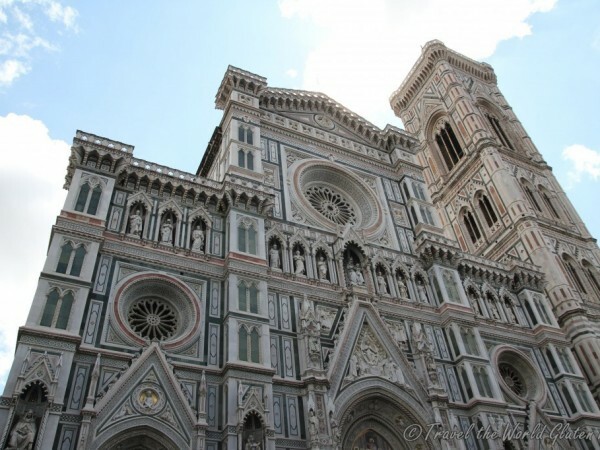 I was so grateful that I felt healthy enough to walk around and sight see in Italy. Really finding out I had to be gluten free couldn’t have come at a better time. 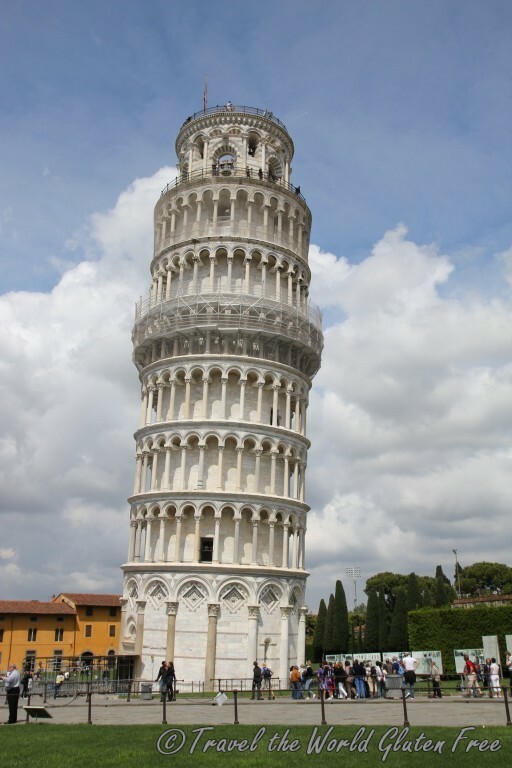 That Italy is such a fantastic place to be gluten free and it was easy learning the ropes there is so much awareness of Celiac Disease and gluten intolerance in Italy. (On the flip side though it meant I got spoiled and it was much harder to find good quality and good tasting gluten free foods at home). 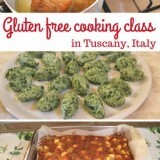 Last Thursday there was a great article in the NY Times about Gluten Free Dining in Italy. It talked about how aware and sympathetic Italians are to those who must avoid gluten and ultimately how well they feed us. With wheat being such a staple in the Italian diet, Italians are so much more conscious of Celiac Disease and gluten intolerance. Reading the article confirmed everything that I had experienced over my three trips to Italy. 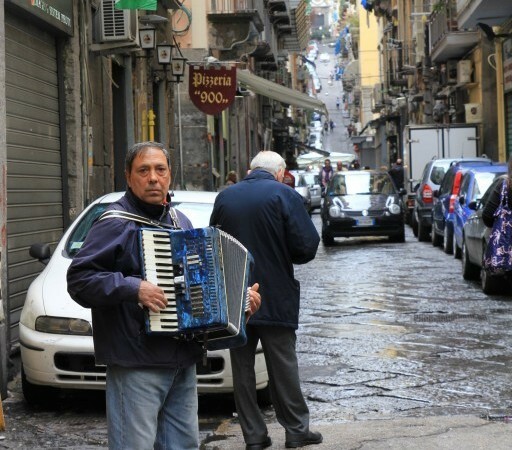 But more so, reading the article just made me miss Italy. I miss the food and how easy it is to eat there. 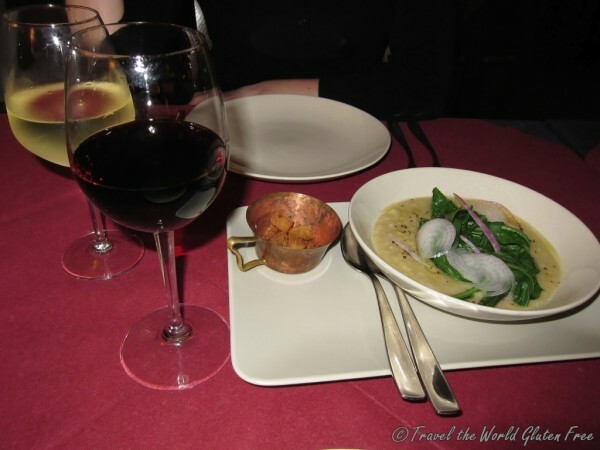 I miss the culture centered around gathering over food and wine. I miss the people and the beautiful landscape. Italy is my favourite place in the world, probably a good part due to the fantastic food. That’s why on almost every trip to Europe I take I try to either fly into or out of Rome so that I can spend a day or two eating Italian food. Italy has been on my mind a lot since reading that NY Times article. It made me realize that I have only written about my most recent trip to Italy last year: gluten free pizza in Roma, our lovely stay at an agriturismo in Tuscany, lunch in Lago di Como, my favourite Gelato shops, and the paradise that is Cala Ganone, Sardini. So I thought I would share some general thoughts about eating gluten free in Italy and some of my favourite gluten free dishes I’ve had at restaurants during my previous trips. It’s like a trip down memory lane for me. Make sure you pronounce it “gloouuutine”, as a shop keeper once told me. These two magical words mean “without gluten”. They are imparative to know if you are traveling to Italy and you need to avoid gluten since they will help ensure that you will eat safely. 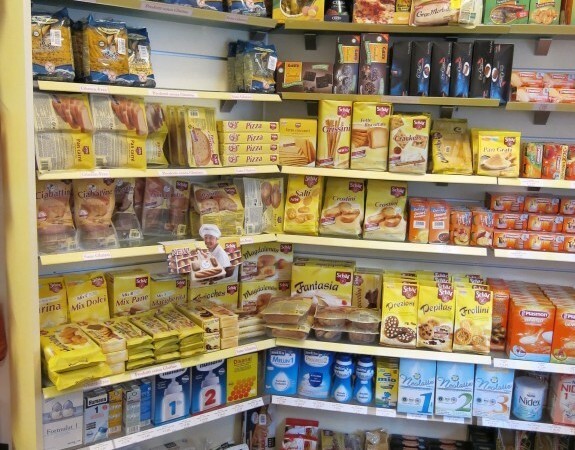 Unlike here in North America where gluten free packaged foods are found at grocery stores, in Italy they are found at the farmacia (pharmacy). This makes it really convenient for locals and travelers alike. While traveling in major cities in Italy, it’s easy to spot the green farmacia signs. Usually I would find multiple farmacias on our walks while sightseeing. Much to Ryan’s dismay, I always like popping in to see what they have on their shelves just in case if I could find a new gluten free treat. On my last two trips to Italy, I’ve also had to avoid gums and soy, which makes it slightly harder when looking at the packaged foods. Thankfully, it’s easy to still find crackers and cookies that I can eat, which to me are the best packaged gluten free items to have in your backpack since they keep well while traveling. 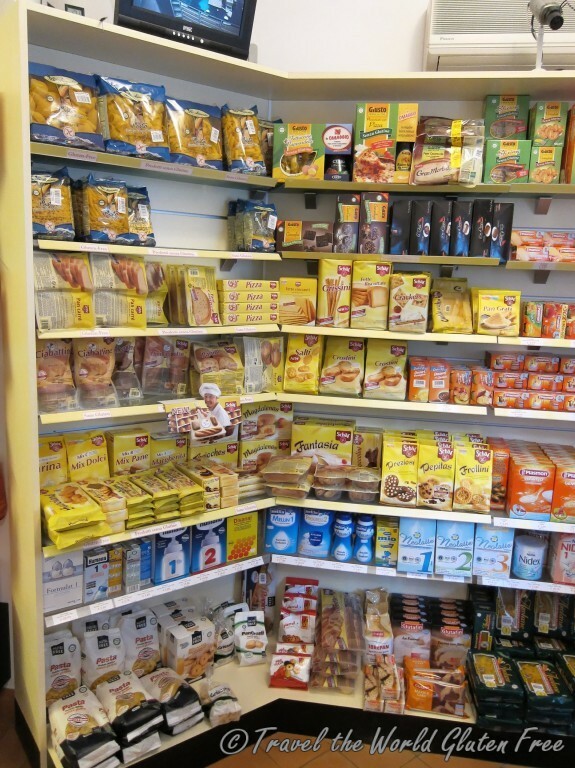 Senza glutine – It’s so amazing being able to find this much gluten free food at the farmacias in Italy. Can you believe this is only one of the sections?! 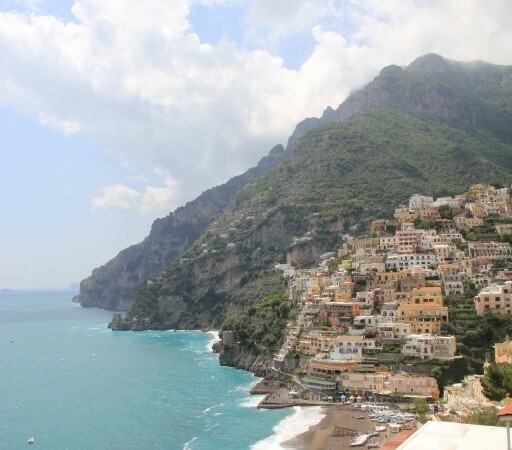 The Amalfi Coast is gorgeous with beautiful views at every turn. 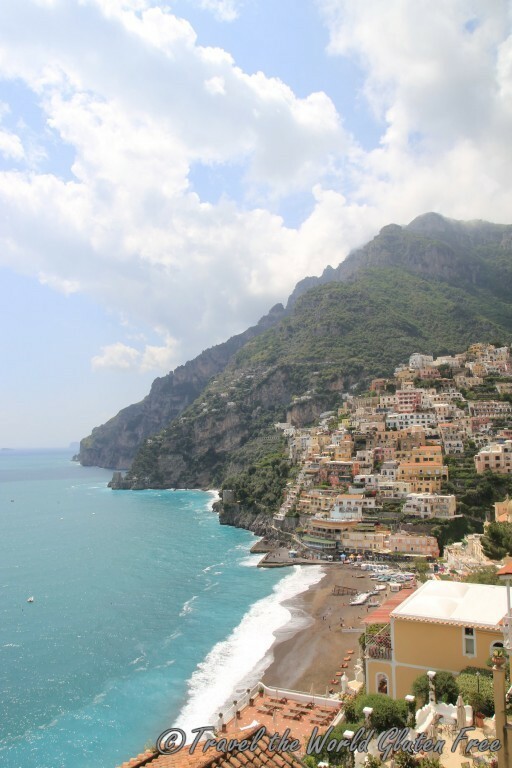 And if you’ve ever taken the local bus between Amalfi and Positano, you’ll know there are a lot of twists and turns! 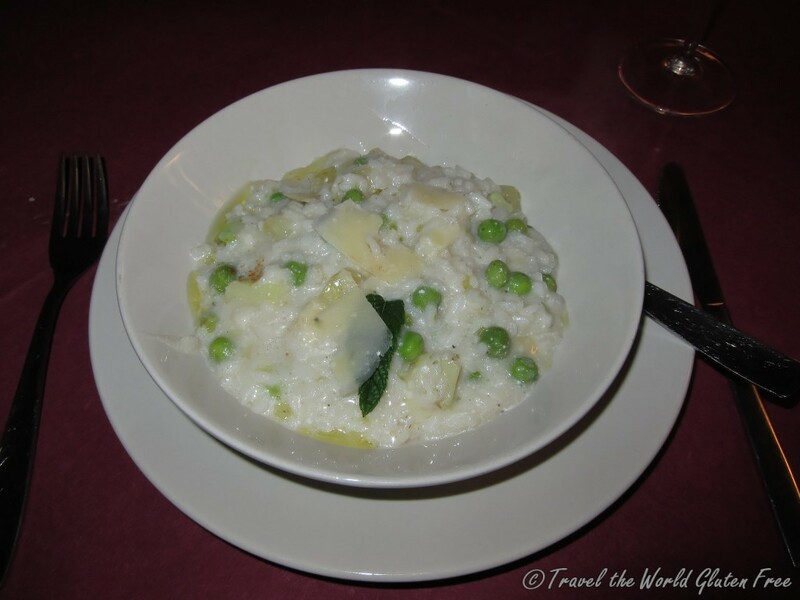 We stayed with Pino at Hotel Fico D’India. It was a real pleasure staying at his family’s bed and breakfast. We had such a lovely time there that we recommended it to my parents and they have since had an equally enjoyable stay at Fico D’India. 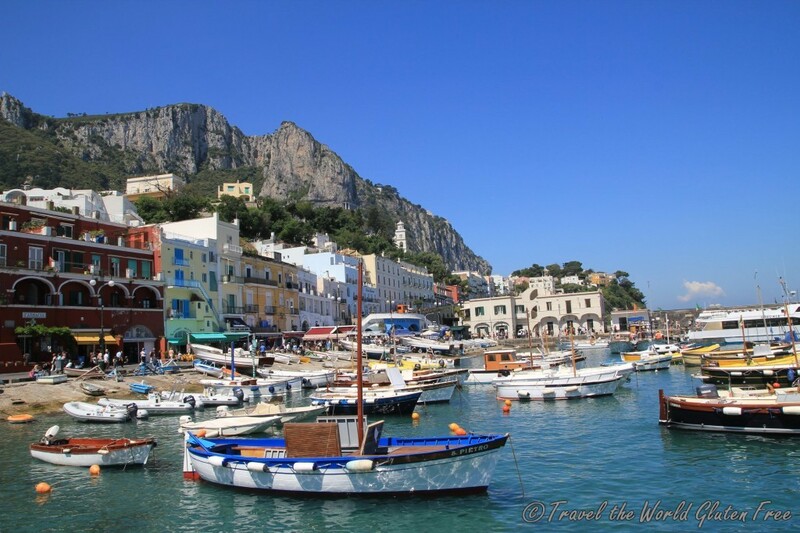 We spent our days soaking up the sun while exploring Capri, Positano, and Amalfi, and our evenings eating dinner and drinking wine at Fico D’India. Pino made such amazing food. He actually scolded me for not telling him ahead of time that I was gluten intolerant so that he could have been prepared and bought me gluten free bread for the first night. He was so concerned with making sure that my stay and my meals were in no way less than those of the other guests. I really appreciated it. Not only did we have great dinners, but he also introduced us to limoncello. Not just any limoncello, but limoncello made by his family from his family’s lemon trees. Stunning views of Positano. 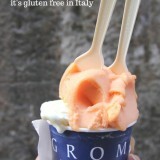 Down in the heart of Positano I found this little stand with the best lemon ice. 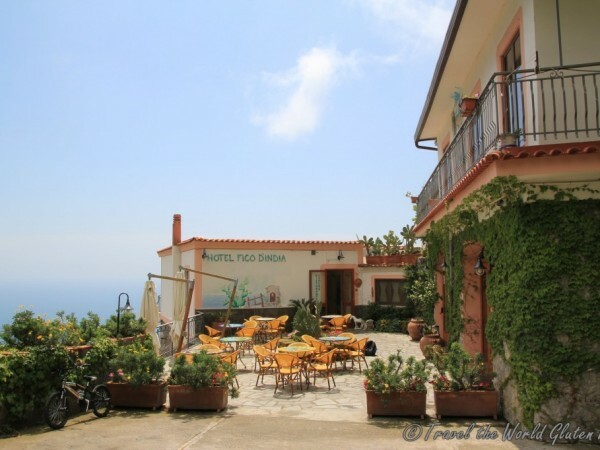 Pino’s beautiful Hotel Fico D’India overlooking the sea. Such lovely service & food during our stay. 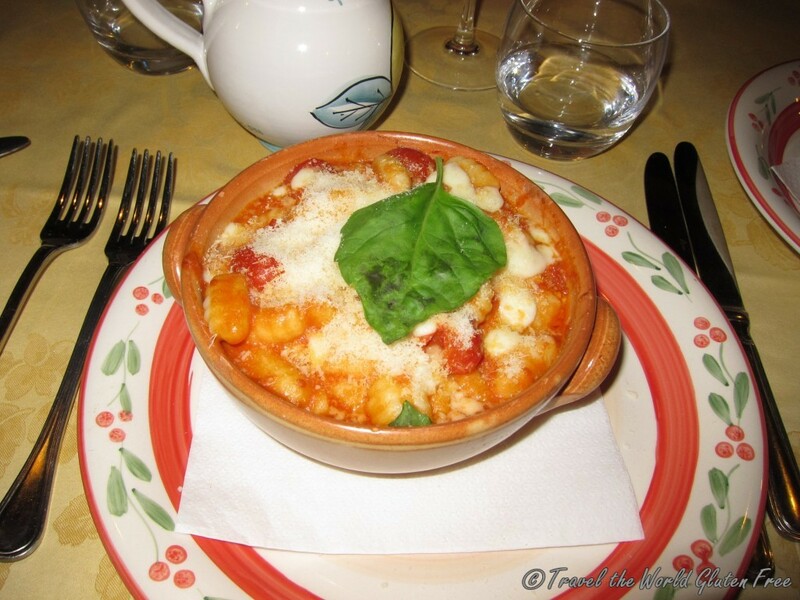 Gluten free potato gnocchi with tomato sauce. 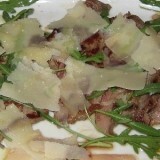 This was served with Pino’s famous bruschetta, made specially gluten free just for me. Amazing. 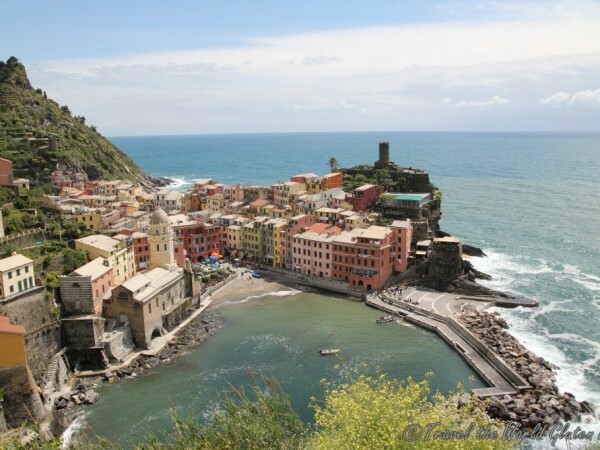 Cinque Terre is really what dreams are made of. 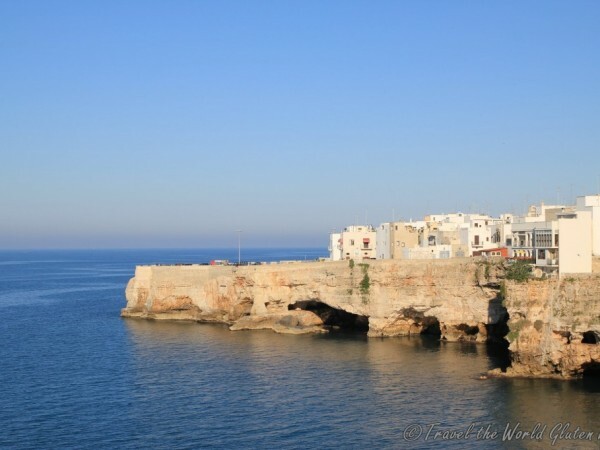 The five picturesque seaside villages are connected by hiking paths, and make for a great excursion. I love the faded look of the once bright buildings, piled on top of one another. It’s fascinating that such a place exists. We really enjoyed our stay here even though we didn’t have the greatest weather thanks to the volcano that erupted in Iceland in 2010 that caused poor weather. It was quite cold and rainy which meant that some of the hiking paths were somewhat flooded, but still who can complain when you’re looking at a view like this? 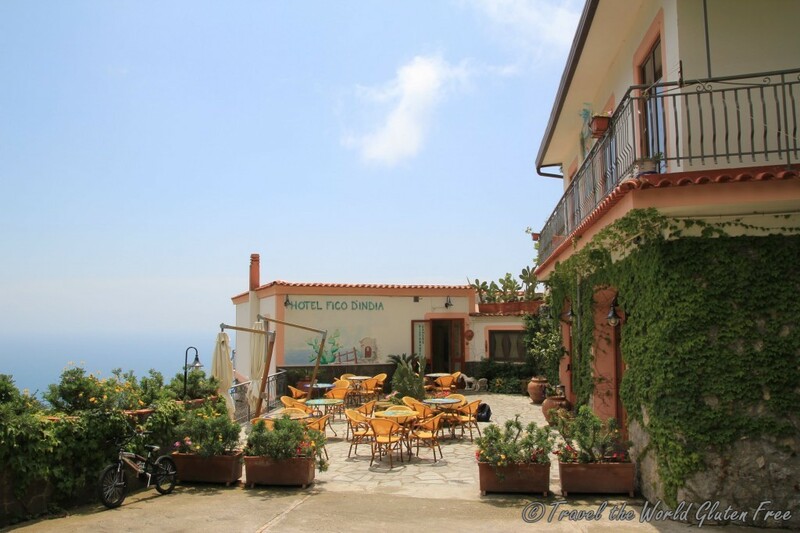 We stayed at a very cute little apartment in Manarola, which meant that we made a lot of our own food during our stay. We bought groceries to prepare breakfast in bed and to make lunches for our hikes. We actually bought a whole cooked chicken on our way into Cinque Terre so that we’d have some good dinners and leftover chicken sandwiches. But of course we had to try eating out for one of the meals. Neither Ryan nor I like seafood, which really is a shame since there was so much fresh caught seafood to eat there. Still we found a great little restaurant called il Porticciolo in Manarola that had gluten free pasta. It was convenient since it was a close walk away from where we were staying. If you’re in Cinque Terre you have to try the local wines. Sciacchetra, a sweet white wine for dessert, is a must. 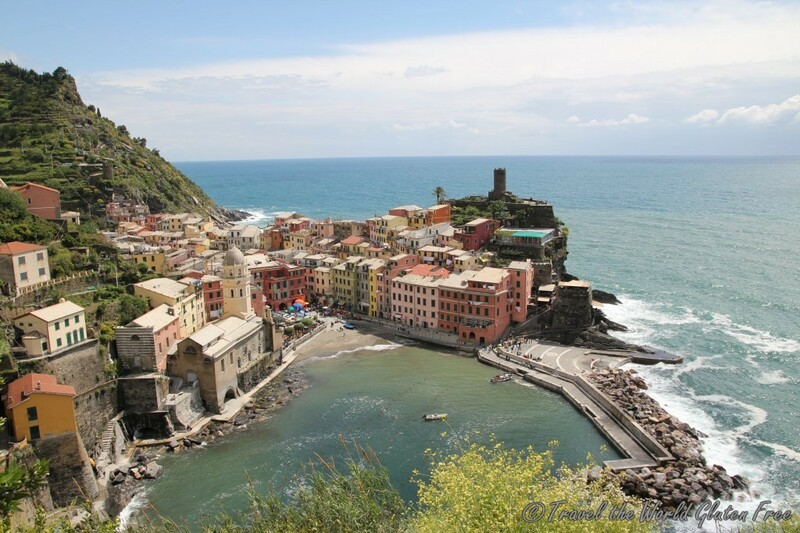 Cinque Terre had such great hiking between each of the five seaside villages. Can’t get tired of views like this! 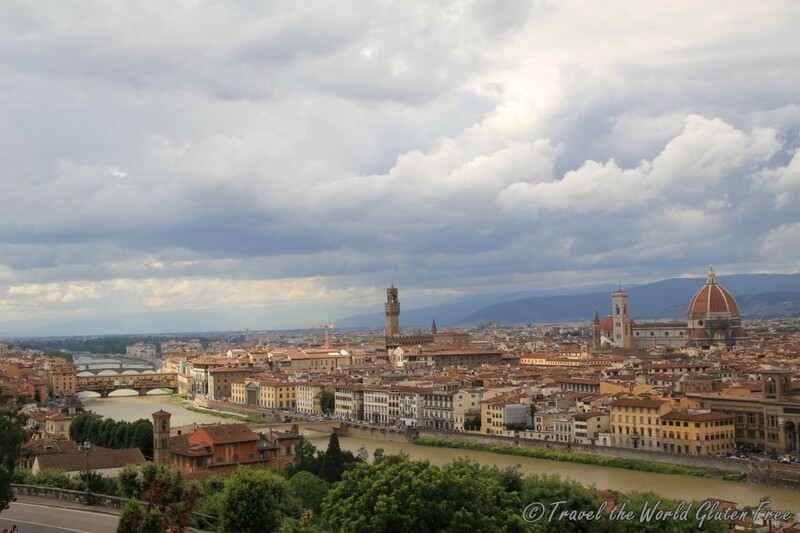 Something we heard often on our travels is that people either love Firenze or Venezia and dislike the other. For me, I much preferred Florence over Venice. Sure there is still hustle and bustle, and I’ll openly admit that I’d rather be in a less touristy place, but its architecture, art and history are wonderful and something not to be missed. 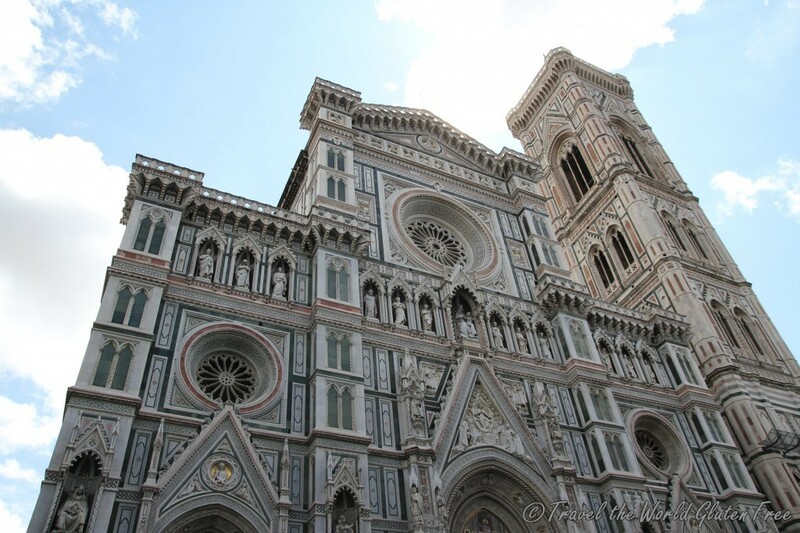 I loved walking around Florence taking in the Duomo, ponte vecchio, palazzo vecchio, and Michelangelo’s David. Yes, perfectly sculpted David. I also found my first gluten free pizza in Florence. 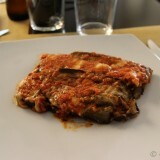 We stumbled upon Le Botteghe di Donatello, a restaurant right near the Duomo, which had a Celiac gluten free menu. They offer gluten free pasta, pizza and dessert. We ended up eating there twice because their gluten free pizza was great and it’s so rare to find good gluten free pizza, of course I wanted more. A gluten free quattro stagoni pizza from Le Botteghe di Donatello in Florence. 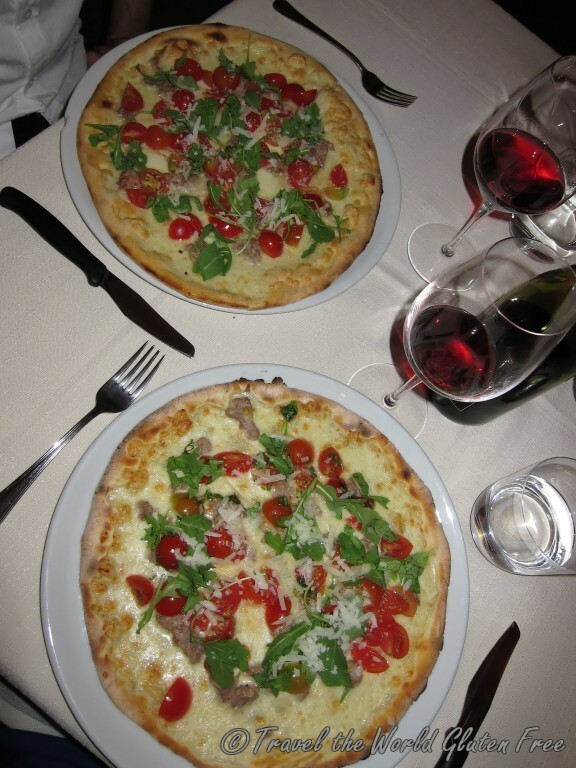 Quattro stagioni means four seasons in Italian, and it’s one of the classic Italian pizzas. 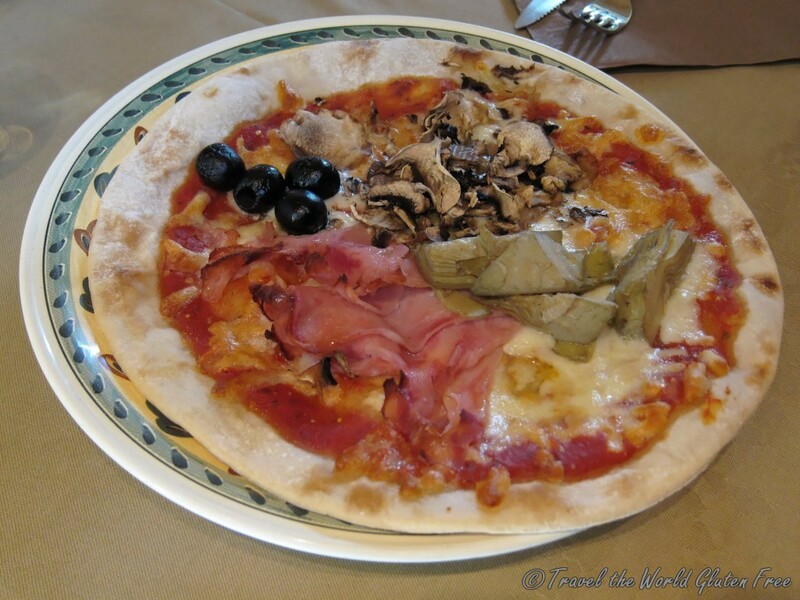 As you can tell by the photo, the pizza is divided into four with each section having its own topping: mushrooms, artichokes, parma ham, and olives. 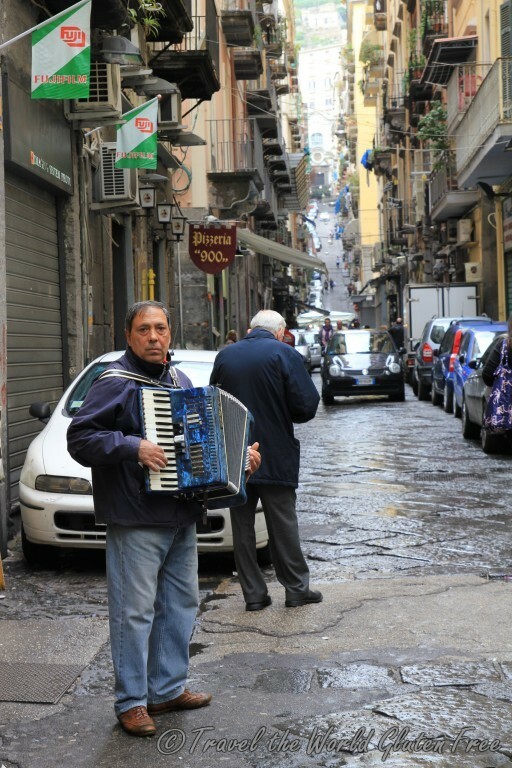 When you think of Naples, I bet the first thing that pops into your head is pizza. 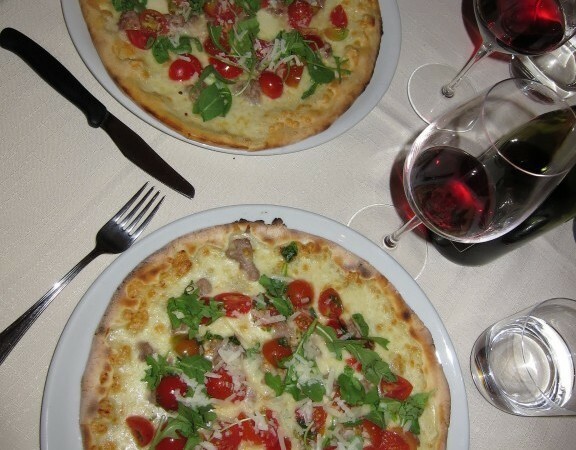 Pizza is synonymous with Naples (and for good reason). 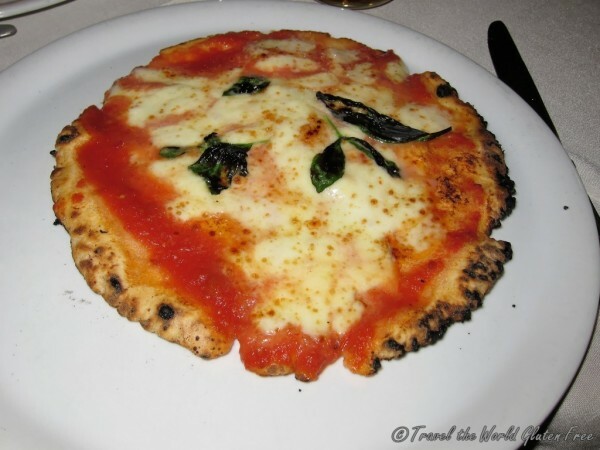 During our short pass by trip through Naples on our way south we had to try the thick crust, wood oven vera pizza Napoletana everybody was raving about. So much in fact that we had to go to two different restaurants so that Ryan could try the best gluten pizza at Gino Sorbillos and I could have the gluten free pizza at Sasa Pizza Mia – La Taverna di Bacco. It was so good! Classic margherita pizza at Sasa Pizza Mia – La Taverna di Bacco. Gluten free of course! This roadtrip was, and still is, my favourite experience in Italy (although that boat ride in Sardinia is a close second). Back in 2010, Ryan and I had actually planned to go to spend 10 days exploring Sardinia at the end of our trip, but thanks to that volcano in Iceland we had unseasonably cold weather so part way through our trip we decided to change plans and rent a car instead to drive to the “heel” of Italy. It was a fabulous 10 days. 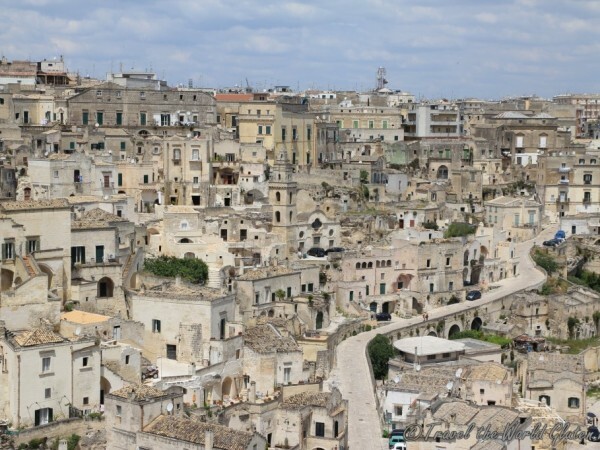 There was little English spoken, hardly any tourists (except for the swarms in Matera and Alberbello) and we could really get the feel of authentic Italian culture. Driving gave us the flexibility to get off the beaten path, plus is was so nice not to have to plan anything in advance. 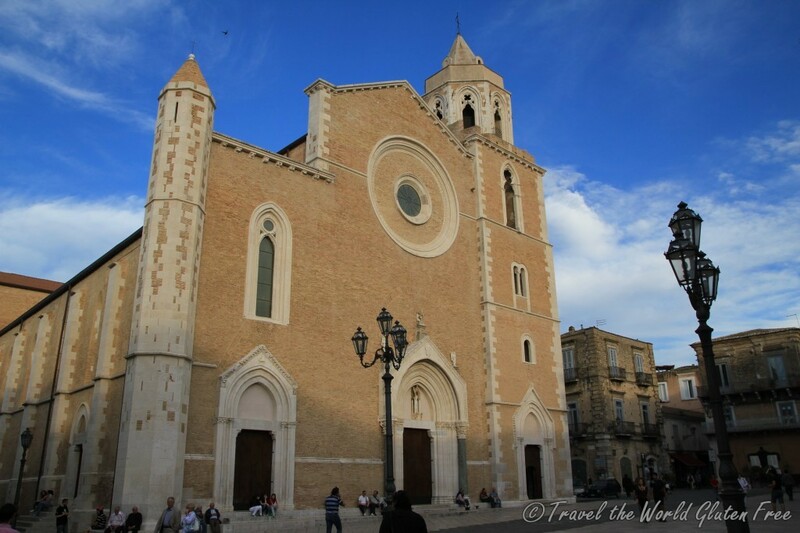 We’d just drive as far or little as we wanted that day and then use our handy Lonely Planet book and our Italian cellphone to call B&Bs to see if they had availability. 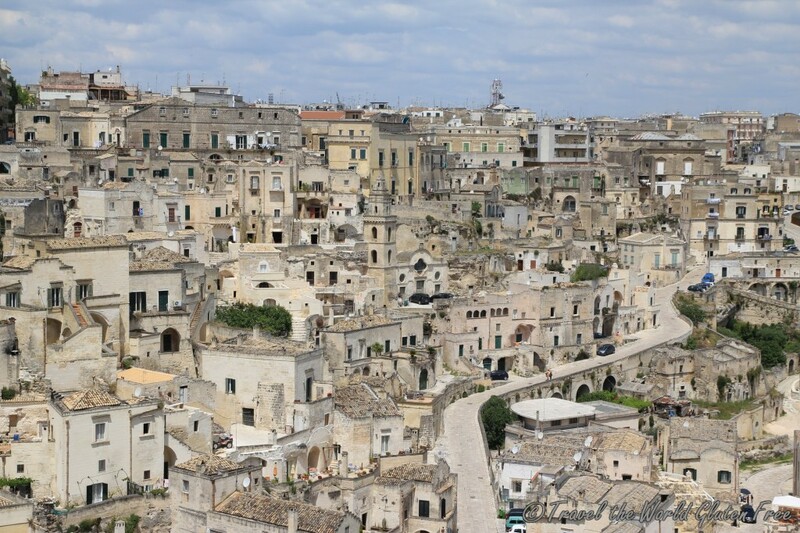 It was a great way to see the beautiful and diverse landscapes in Southern Italy. 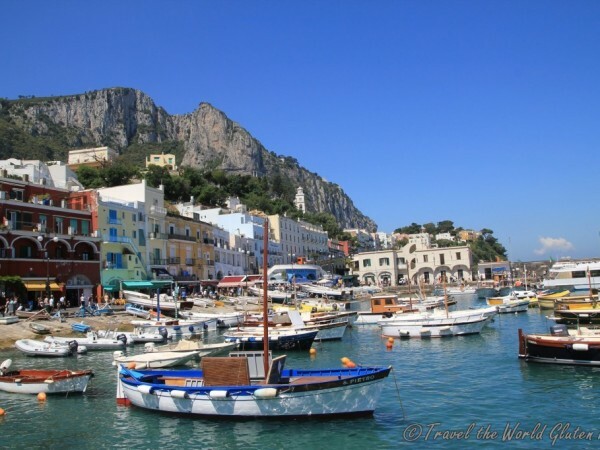 Mountains, forested national parks, farmland, rugged coastlines, and crystal clear seas. We even came across a herd of wild horses and some huge bulls with large horns that blocked our road one day. 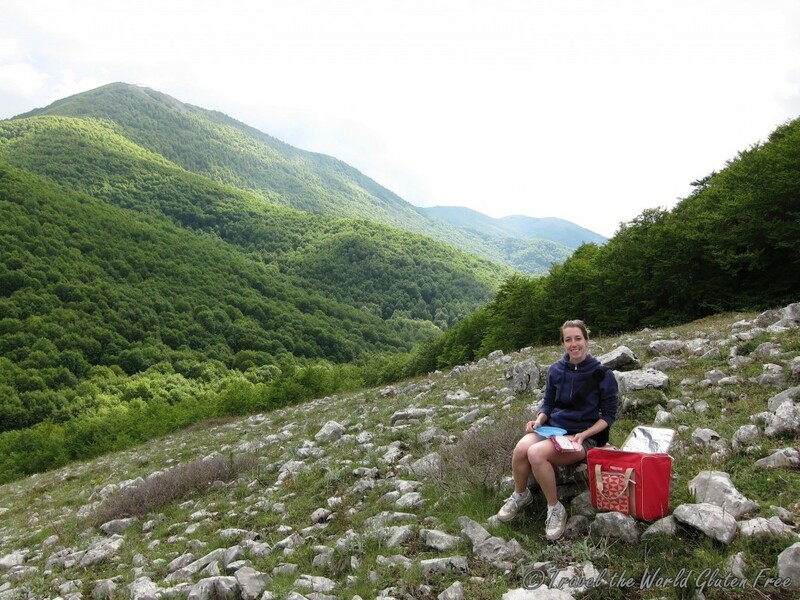 Great spot for a picnic in Parco Nazionale del Pollino. We had so many picnic lunches in picturesque settings on our road trip. On the menu? Salumi, a few local cheeses, gluten free crackers, ripe tomatoes, and fresh fruit. 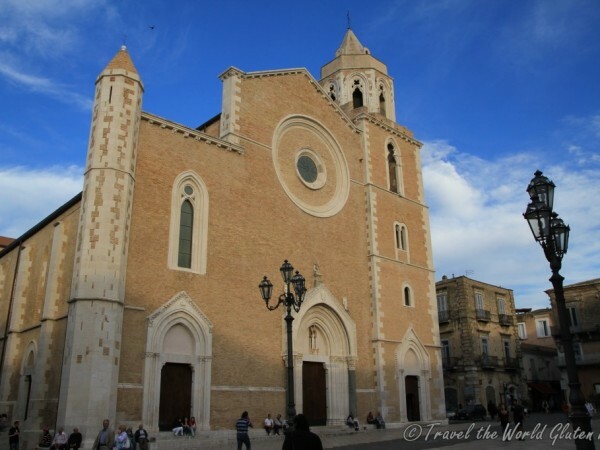 Lucera – I have very fond memories of Lucera. This is not only where Ryan and I splurged to spend one night at Le Foglie di Acanto in a breathtaking 16th-century palazzo, but also where I ate hands down the best gluten free pizza I have ever had. It’s actually quite funny how we came to eat at that particular restaurant. We had wandered around Lucera and found ourselves at a farmacia, looking for gluten free food no less, when I asked the pharmacist if he knew of any good restaurants that had gluten free dishes. Suddenly a big discussion breaks out and the two other customers in the store also chime in. Everyone wanted to make sure that I got to a really great restaurant that would keep me safe – again a reason why I love eating in Italy. Italians are so passionate about their food, but they also so badly want to keep us gluten free folk safe and well fed. They knew of the perfect restaurant but with Lucera’s centro storico being so old and having so many small streets, most of them weren’t named so the directions were getting confusing. Then wouldn’t you know one of the customers offered to walk us there. We had such a great conversation together as we walked through the streets and we discovered that this kind man had previously worked at the Italian consulate in Canada before (such a small world). We kept walking in and out of small side roads until we got to the restaurant, which as luck would have it turned out to be literally RIGHT in front of our hotel!! One of the great memories from our trip. The restaurant was downstairs at B&B Elena degli Angeli (Piazza Oberdan, 3 Lucera), which is run by the B&B owner’s son who is gluten free. Ryan and I both ordered the D’Auria pizza with bufala, salsiccia fresca, pomodorini, rucola e grana. This introduced us to white pizza made with an olive oil base instead of tomato sauce. I’m so glad we took the waiter’s advice to keep the pizza white as it was designed to be. The pizza was out of this world. The sweet cherry tomatoes burst with flavour and complimented the tart arugula. The sausage and buffalo mozzarella oozed together. And the crust was crisp and crunchy and in no way gummy, just like a crust should be. I remember being worried for a second that they gave me the gluten pizza by mistake since it was that good, but then I remembered I was in Italy and pizza this good was normal and, at the same time, an art form. To top off the whole meal, I’m also extremely glad we took the waiter’s advice to get a bottle of Fichimori, a chilled red wine that pairs perfectly with pizza. I’ve never heard of chilled red wine before, but wow was it good. We brought a couple bottles home with us. Needless to say, this was our favourite meal of our trip. Can you tell which of these two pizzas is gluten free? Damn right! It’s about time a gluten free pizza was the same size and almost identical to the gluten version (mine’s the one at the bottom). This is the BEST gluten free pizza I have eaten, ever. Thank you restaurant downstairs at the B&B Elena degli Angeli in Lucera, Italy. Our beautiful breakfast spread at Le Foglie di Acanto, the stunning 16th-century palazzo we splurged to stay at for one night in Lucera. Well worth it! 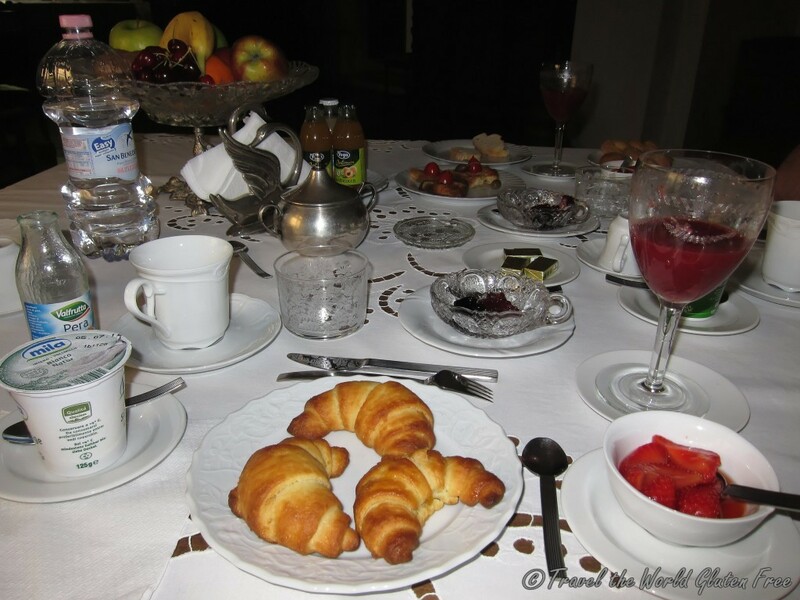 The breakfast included fresh fruit preserves, stewed strawberries, and gluten free croissants. 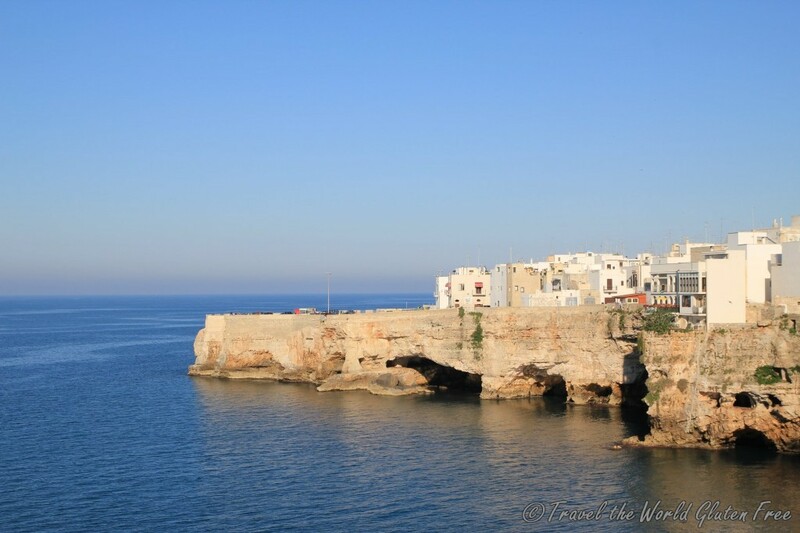 Vieste – We had a wonderful meal at Al Cantinone in Vieste’s centro storico (Via Carlo Mafrolla, 26). It has a small menu of fresh, local and in season food, which is always the sign of good things to come. The staff was very lovely and walked us through the menu and pointed out which items were gluten free or that they could make gluten free. They suggested a thick fava bean soup-like dish as an appetizer and kept the croutons separate for me. It was so hearty and flavourful. Then I had a nice sweet pea risotto. Ryan and I were at the restaurant for over two hours and we were happy to discover we were the last ones there. We joked that we were too Italian for the town since by our third week in Italy we had grown accustomed to the late, 2-3 hour long dinners followed by an evening stroll. Fava bean soup at Al Cantinone in Vieste. Such a great restaurant that serves fresh, local and in season food. 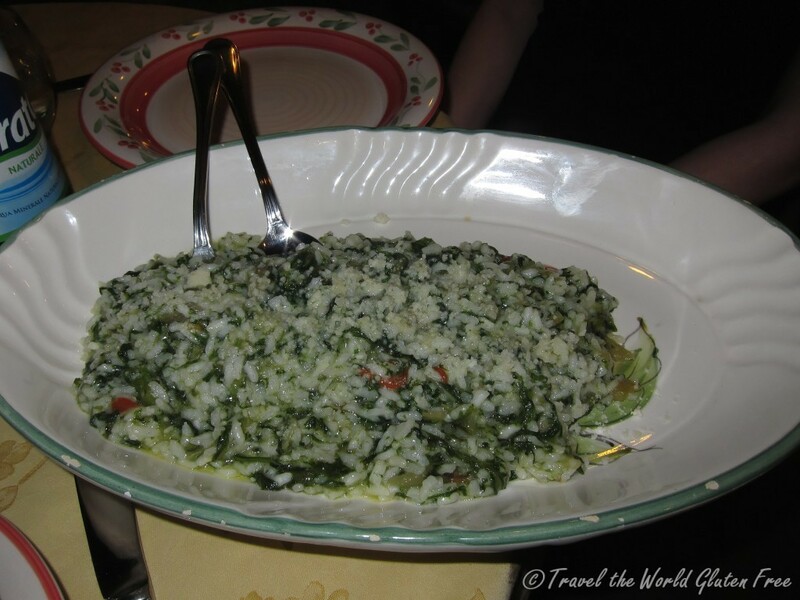 Italy will always have a special place in my heart (and my stomach!!). I’m so appreciative of the way Italians feed those of us who need to avoid gluten. 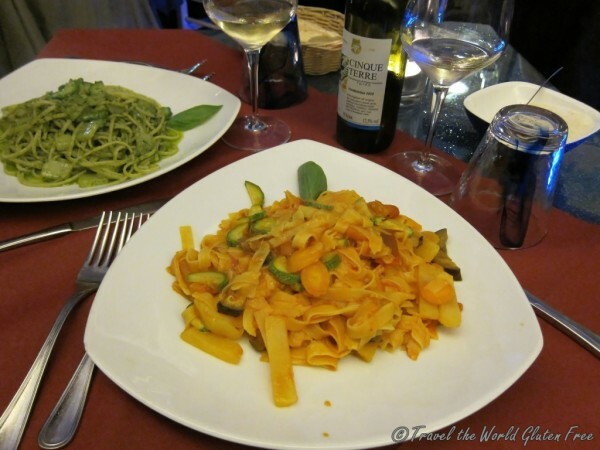 While I will admit that there still are times, especially on the go, when it’s harder to find gluten free options, on the whole Italy is an incredible place to travel to if you have Celiac Disease or are gluten intolerant. It’s one of those places where you don’t feel left out at the dinner table.